After 30 years of use, Archie-M remains the preferred option for assessment with most consultants and owners in the UK and beyond. We have users as far afield as Australia. We continue to develop both the program and the theory on which it is built. Bill is currently working on a completely new distribution model that should provide a real distinction between safe bridges and those which might deteriorate with heavy use. The model will also provide the first real indication of capacity for bridges with significant skew. 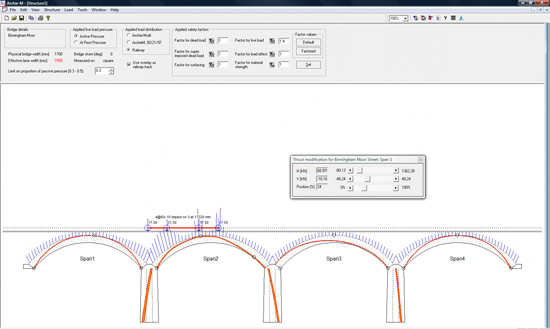 Was designed to help engineers (and the author first of all) to assess arch bridges. It is not like other programs. It is designed from the start to encourage users to explore possibilities when analysing arches rather than simply ask for a result. The first version of Archie was sold to the Northern Ireland DoE in 1985. The market grew to about 160 users by 1995 but lack of care nearly led to closure in 1999. OBVIS Ltd was formed then to build a new Archie which we call Archie-M. This screenshot shows Archie-M being used to assess three spans of a viaduct at Moor Street, Birmingham. The load is applied to span 2 and balancing forces have been provided from span 3 to keep the thrust inside all the piers..